I started the Cardinal pair a year ago last March. Even though I bound it and showed it, I was not happy with the balance. So I sat on it. I had added leaves, cut them off and then left it for a year. It wasn't until I went walking with hubby in the park I finally realized how to finish this piece. The missing item were the feathery flowers on the maples. and finally to Spring 2018, lots of content and better weight. 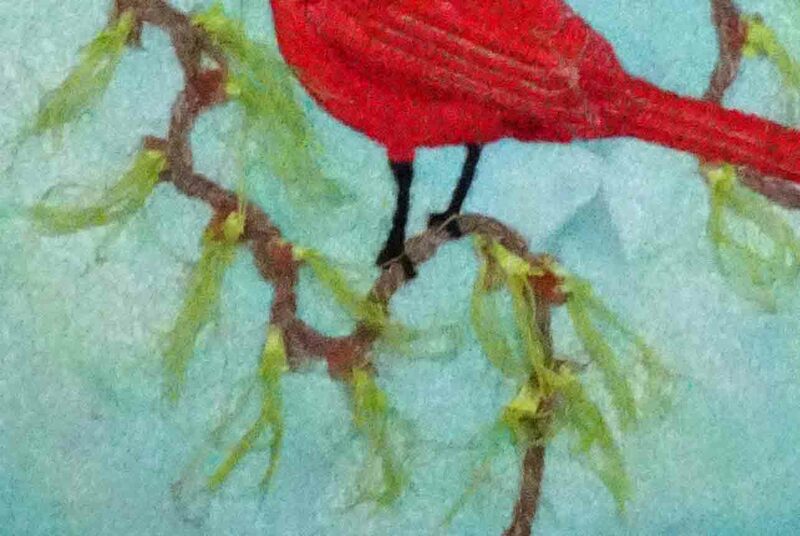 Three single strands of embroidery floss, different shade of green, were threaded through the tiny bud. Each is about 2+ inches long so they fall, float and flutter the way they should. NOW this pieces is finished. A year is not to long to wait..to get it right.